Download "IN THE SUPREME COURT OF FLORIDA. By, -.., Deputy. Clerk,,p DISCRETIONARY REVIEW OF THE DECISION SECOND DISTRICT COURT OF APPEAL STATE OF FLORIDA"
4 PELIMINARY STATEMENT CHARLES KOOPMAN will be referred to as the "Appellant" or as he stood before the trial court or on direct appeal in this Brief and the STATE OF FLORTDA will be referred to as the "Appellee" or "State". 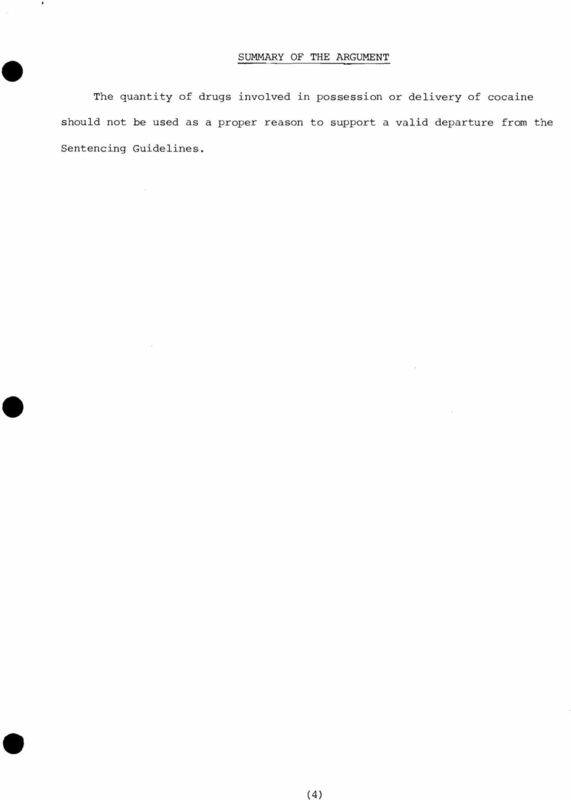 The Record on Appeal will be referenced by the symbol "R" followed by the appropriate pape number. 6 Court further found that there was no breach of trust involved since, in fact, the Appellant had resigned from his teaching position several months prior to committing the offense. Regarding the final reason the trial Court gave for the instant departure, i.e. 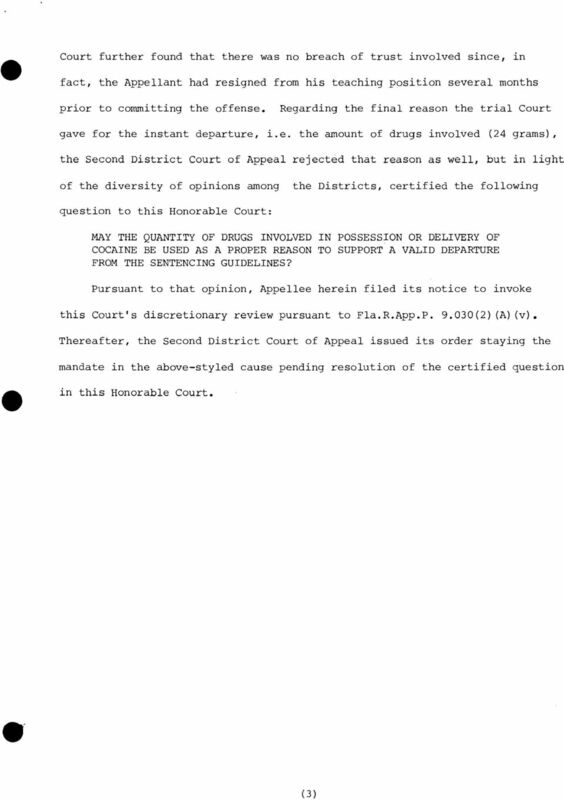 the amount of drugs involved (24 grams), the Second District Court of Appeal rejected that reason as well, but in light of the diversity of opinions among the Districts, certified the following question to this Honorable Court: MAY THE QUANTITY OF DRUGS INVOLVED IN POSSESSION OR DELIVERY OF COCAINE BE USED AS A PROPER REASON TO SUPPORT A VALID DEPARTURE FROM THE SENTENCING GUIDELINES? Pursuant to that opinion, Appellee herein filed its notice to invoke this Court's discretionary review pursuant to Fla. R.App.P (2) (A) (v). Thereafter, the Second District Court of Appeal issued its order staying the mandate in the above-styled cause pending resolution of the certified question in this Honorable Court. 7 SUMMARY OF THE ARGUMENT The quantity of drugs involved in possession or delivery of cocaine should not be used as a proper reason to support a valid departure from the Sentencing Guidelines. 8 ARGUMENT ISSUE I MAY THE QUANTITY OF DRUGS INVOLVED IN POSSESSION OR DELIVERY OF COCAINE BE USED AS A PROPER REASON TO SUPPORT A VALID DEPARTURE FROM THE SENTENCING GUIDELINES? (As certified to this Court by the Second District Court of Appeal, State of Florida). The amount of cocaine involved in&e instant case (approximately 24 grams) was under the amount for a trafficking charge. Assuming no prior record or other charges, possession and delivery of that amount calls for any non-state prison sanction under the Sentencing Guidelines while simple possession over 8 grams adds up to a three and a half to a four and a half year prison sentence with a three-year minimum mandatory sentence. his sufficient difference would lead one to believe that the Florida Legislature chose twenty-eight grams (1 ounce) as the cut-off amount for good reasons. One likely reason is that an ounce or more indicates an experienced dealer as opposed to someone possessing generally for personal use or small-time transactions. Appellant would propose that answering the certified question in the affirmative would create arbitrary decisions as to what constitutes a large amount within the one to twenty-eight gram range. Is ten grams a large amount? Should it exceed twenty grams? Should it be closer to twenty-eight grams such as over 26.5? Appellant would argue that quantity of drugs involved is an invalid reason for departure because quantity is an inherent component of the offense which has already been factored in the Guidelines score. State v. Mischler, 488 So.2d 523 (Fla. 1986); Hendrix v. State, 475 So.2d 1218 (Fla. 1985); Newton v. State, 490 So.2d 179 (Fla. 1st DCA 1986). 9 Appellee relies heavily on Seastrand v. State, 474 So.2d 908 (Fla. 5th DCA 1985). It should be noted that Seastrand involves a very large amount of LSD and, as the Court pointed out, the Guidelines totally ignore the amount involved. This is not the case with cocaine which has a clear-cut breakdown of escalating sentences based on amount up to over 400 grams. Accordingly, Appellant would contend that upward departure due to the amount of drugs should be allowed only when a sufficient deviation from the standard occurs (i.e. 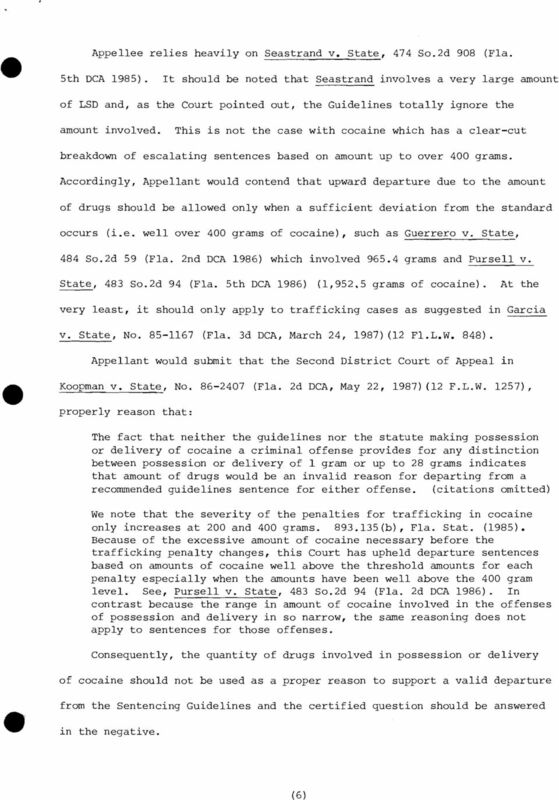 well over 400 grams of cocaine), such as Guerrero v. State, 484 So.2d 59 (Fla. 2nd DCA 1986) which involved grams and Pursell v. State, 483 ~o.2d 94 (Fla. 5th DCA 1986) (1,952.5 grams of cocaine). At the very least, it should only apply to trafficking cases as suggested in Garcia v. State, No (Fla. 3d DCA, March 24, 1987)(12 F1.L.W. 848). 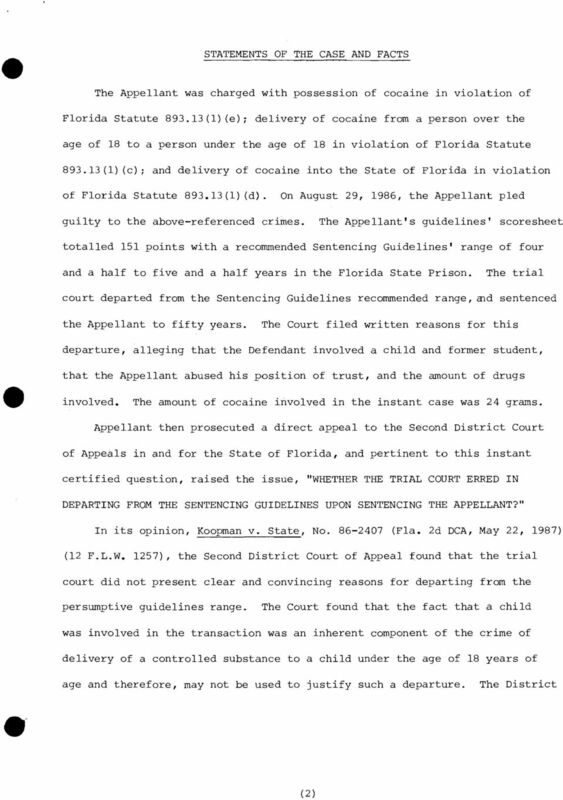 Appellant would submit that the Second District Court of Appeal in Koopman v. State, No (Fla. 2d DCA, May 22, 1987)(12 F.L.W , properly reason that: The fact that neither the guidelines nor the statute making possession or delivery of cocaine a criminal offense provides for any distinction between possession or delivery of 1 gram or up to 28 grams indicates that amount of drugs would be an invalid reason for departing from a recommended guidelines sentence for either offense. (citations omitted) We note that the severity of the penalties for trafficking in cocaine only increases at 200 and 400 grams (b), Fla. Stat. (1985). Because of the excessive amount of cocaine necessary before the trafficking penalty changes, this Court has upheld departure sentences based on amounts of cocaine well above the threshold amounts for each penalty especially when the amounts have been well above the 400 gram level. See, Pursell v. State, 483 So.2d 94 (Fla. 2d DCA 1986). In contrast because the range in amount of cocaine involved in the offenses of possession and delivery in so narrow, the same reasoning does not apply to sentences for those offenses. Consequently, the quantity of drugs involved in possession or delivery of cocaine should not be used as a proper reason to support a valid departure from the Sentencing Guidelines and the certified question should be answered in the negative. IN THE SUPREME COURT OF FLORIDA CASE NO. 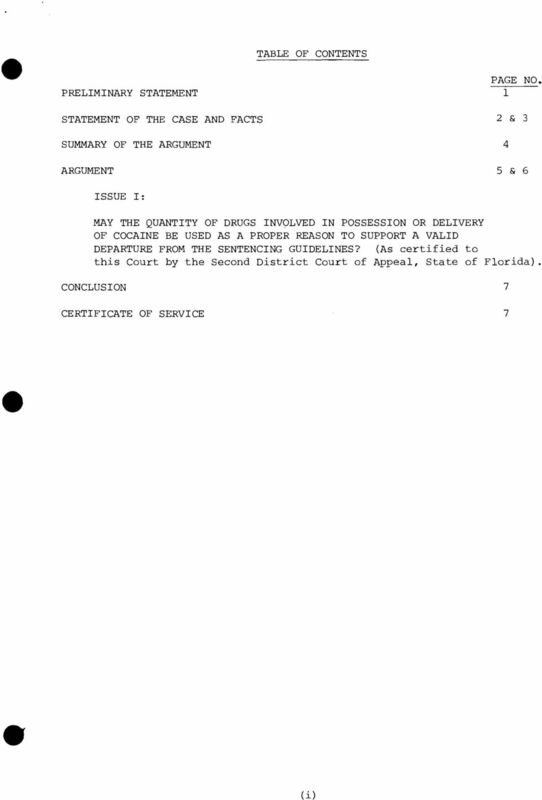 04-1461 STATE OF FLORIDA, Appellant, vs. SEAN E. CREGAN, Appellee. IN THE SUPREME COURT OF FLORIDA (Lower Court Case No. : 4D05-746) CASE NO. SC05-1395 STATE OF FLORIDA, Petitioner, vs. JEFFREY LOVELACE, Respondent. IN THE SUPREME COURT OF FLORIDA CASE NO. SC96,090 TFB NO. 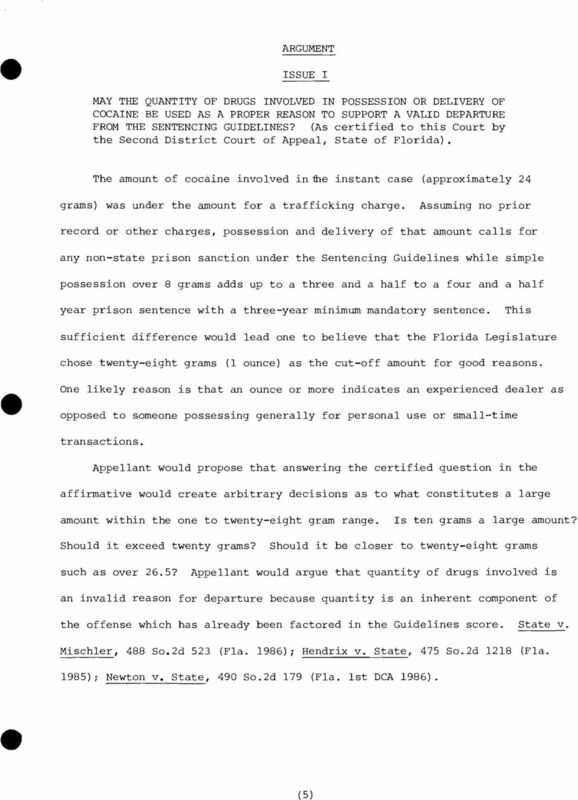 99-10,015 (13F) THE FLORIDA BAR Appellee v. JOHN STANLEY MORSE Appellant RESPONSE BRIEF OF APPELLANT John S. Morse, Esquire John S. Morse, P.A. FILED AND. TARASKA, GROWER, UNGER & KETCHAM, P.A. Ateorneys for Defendants SHIRLEY DOELFEL, ET VIR. vs. THOMAS P. TREVISANI, M.D., ET AL. Respondents. IN THE SUPREME COURT STATE OF FLORIDA TALLAHASSEE, FLORIDA RESPONDENT'S ANSWER BRIEF W+ CLINTON WALLACE, ESQUIRE. J^s . CLINTON WALLACE, P.A. IN THE CIRCUIT COURT, FOURTH JUDICIAL CIRCUIT, IN AND FOR DUVAL COUNTY, FLORIDA. Case No: 16-2001-CF-2576-AXXX Division: CR-G WILLIAM JOE JARVIS. vs. IN THE CIRCUIT COURT OF THE NINTH JUDICIAL CIRCUIT, IN AND FOR ORANGE COUNTY, FLORIDA PROGRESSIVE AMERICAN INSURANCE COMPANY, CASE NO. : 2014-CV-000079-A-O Lower Case No. 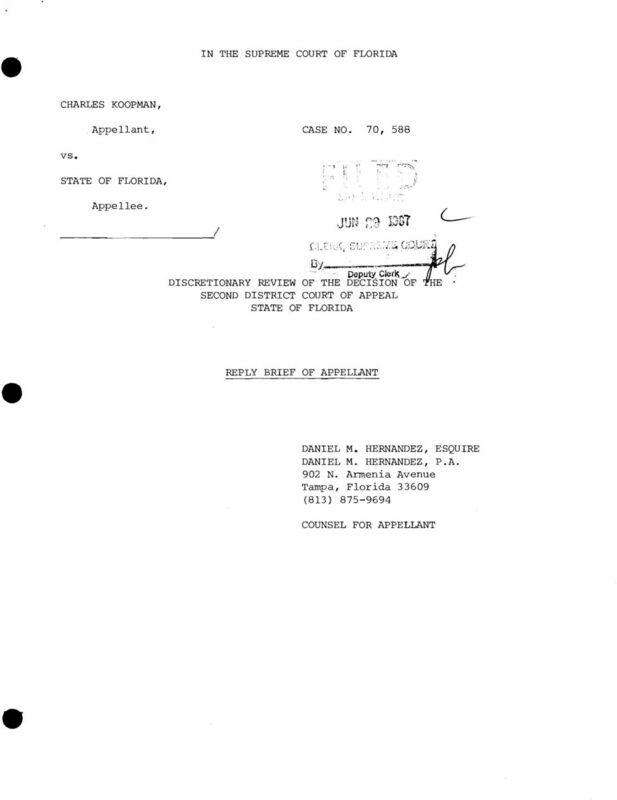 : 2012-SC-002127-O Appellant, v.
Attorneys for Petitioners IN THE SUPREME COURT OF THE STATE OF FLORIDA. State of Florida. Suite 1003 19 West Flagler Street Miami, Florida 33130. vs. IN THE SUPREME COURT OF THE STATE OF NEVADA MICHAEL ALLEN MULLEN v. Appellant, THE STATE OF NEVADA, Respondent. FAST TRACK RESPONSE CASE NO: 63750 Electronically Filed Nov 12 2013 12:03 p.m. Tracie K.
L.T. CASE NO. : CL 92 12961 AJ. Pet it ioner, Fla. Bar SUPREME CT CASE # 86,434 GOVERNMENT EMPLOYEES INSURANCE COMPANY, SUSAN KRAWZAK, Respondent. David P. Healy of Law Offices of David P. Healy, PL, Tallahassee, for Appellant. IN THE CIRCUIT COURT OF THE NINTH JUDICIAL CIRCUIT IN AND FOR ORANGE COUNTY, FLORIDA BRUCE LYNN CRUM, CASE NO. CVA1 07-83 County Court Case No. 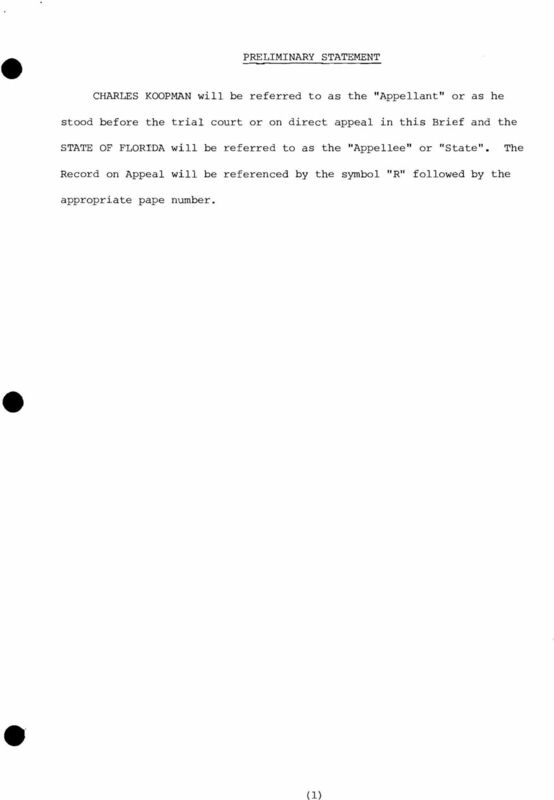 07-TR-154449-O Appellant, vs. STATE OF FLORIDA, Appellee. IN THE CIRCUIT COURT OF THE NINTH JUDICIAL CIRCUIT, IN AND FOR ORANGE COUNTY, FLORIDA ELAINE MORRIS, TRUSTEE, CASE NO. 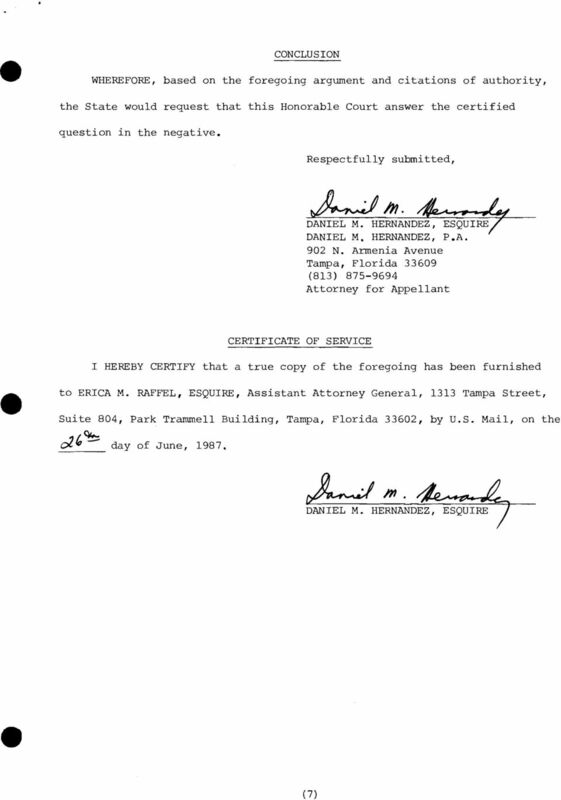 : 2014-CV-52-A-O TRULIET INVESTMENTS, LLC v. Appellant, CITY OF ORLANDO, FLORIDA Appellee.